Figure 1.15 provides an overview of the main causes at a global level. Haemorrhage (ante and post partum) is the largest direct global cause of deaths at 27%, followed by hypertension (14%). In combination indirect causes also account for 27% of global deaths. There is an opportunity to refresh your understanding of direct and indirect causes in the reflection exercise below. Data sources: Say, L., Chou, D., Gemmill, A., Tuncalp, O., Moller, A, Daniels, J., Gulmezoglu, M., Temmerman, M., Alkema, L. 2014. There are globally accepted definitions for both direct and indirect causes of maternal death which facilitate comparison and trend analysis at different levels. Defining the causes of deaths is also an integral part of ensuring effective health and social care systems for the reduction of deaths. Check your knowledge: what are the differences between direct and indirect maternal deaths? The WHO defines direct causes of maternal mortality as deaths that result from obstetric complications of pregnancy (including delivery and the postpartum period). Examples of direct causes include antepartum and postpartum haemorrhage, eclampsia, sepsis, obstructed labour and complications of abortion. Indirect causes of maternal mortality are maternal deaths that result from previously existing conditions or diseases that developed during pregnancy and were not due to direct obstetric causes but are aggravated by the physiological effects of pregnancy. Examples include communicable conditions (e.g. malaria, HIV), psychiatric illnesses (e.g., suicide and violence) and well as non-communicable conditions (e.g. anaemia, cardiovascular diseases and diabetes). Indirect deaths account for a significant proportion of maternal deaths particularly where infections such as malaria, hepatitis and HIV are endemic. Many country systems are not able to capture deaths from indirect causes occurring outside of the EmONC health system; this can lead to a general underreporting or incorrect classification of maternal deaths. Globally the increasing prevalence of obesity and related chronic conditions such as diabetes and cardiovascular disease is having an impact on maternal mortality in low, middle and high income countries. There are implications on existing and planned health systems and on how resources and specialist skills are allocated. Indicators such as the percentage of deaths due to indirect causes at emergency obstetrics facilities are being routinely monitored in some countries as a proxy for the effectiveness of other programmes to prevent and manage chronic conditions. Figure 1.16 presents regional data for the major causes of maternal death, arranged by region. Alternatively, you can view a comparison of causes across regions instead. 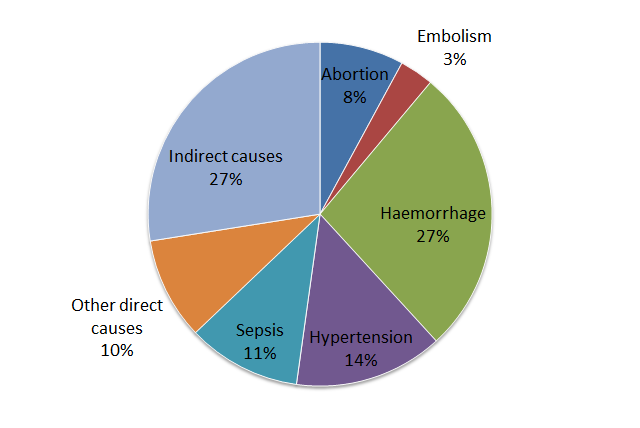 Figure 1.16: Estimates for main causes maternal of death worldwide. Point estimates are shown by bars (and squares) and 95% uncertainty intervals are shown by the horizontal lines. CoDD=cause of death distribution. ABO=abortion. EMB=embolism. HEM=haemorrhage. HYP=hypertension. SEP=sepsis. DIR=direct causes. IND=indirect causes. Dev=developed regions. N Africa=northern Africa. SSA=sub-Saharan Africa. E Asia=eastern Asia. S Asia=southern Asia. SE Asia=southeastern Asia. W Asia=western Asia. CC Asia=Caucasus and central Asia. LAC=Latin America and the Caribbean. The previous section showed an overall downward trend in neonatal deaths. 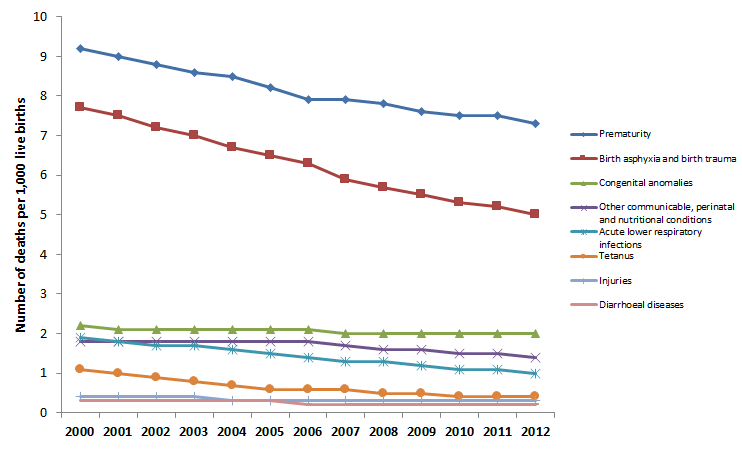 The following graph shows the major causes of neonatal mortality and trends over time. Deaths due to prematurity and due to birth asphyxia or trauma have seen the greatest reductions. Neonatal deaths constitute 41.6% of all deaths for under-fives. 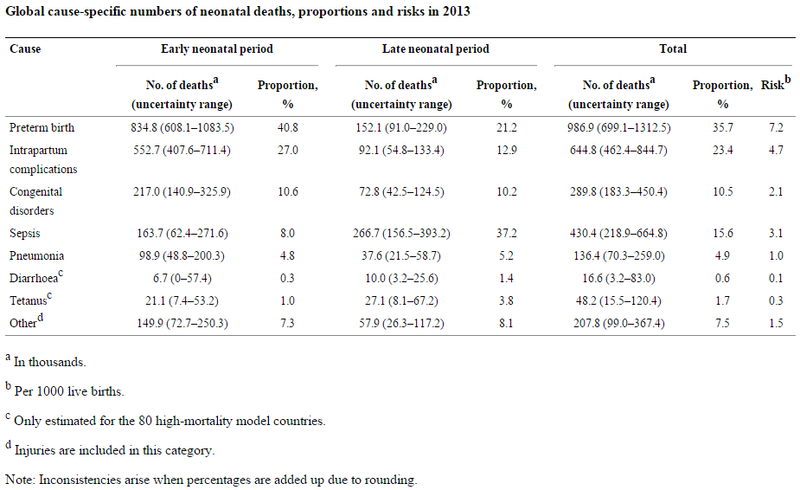 So what are the major causes of neonatal mortality globally? 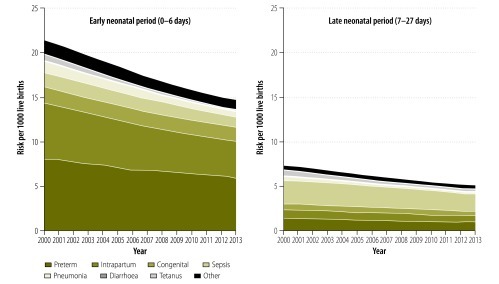 Figure 1.17 below shows you the major causes of neonatal mortality trends over time. Data sources: World Health Organisation 2013. Figure 1.20 provides an overview of the main causes at a global level. Are the existing post natal practices meeting international standards? Are they adequate for the specific needs? The previous section raised the issue of the association of early neonatal death with pregnancy related issues and later neonatal death with environmental issues. Looking at the causes of maternal and neonatal mortality in your country over the last 5 years. What changes have occurred and what more could be done to reduce neonatal mortality?